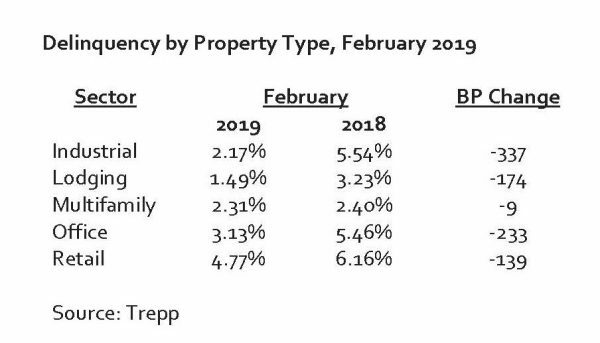 The Trepp CMBS delinquency rate broke through the 3% threshold in February 2019 as the reading continues its steady decline. The February reading fell 15 basis points (bp) to 2.87% from 3.02% registered in January. The February result is another post-crisis low. The delinquency rate is 164 bp lower year over year. The reading started to fall after the June 2017 report, when CMBS delinquencies registered at 5.75%. Since then, the rate has fallen in 18 of the last 20 months. The all-time high of 10.34% came in July 2012. Further declines are possible. The delinquency rate for CMBS 2.0 loans was 0.63% in January, and as pre-crisis delinquent loans are resolved, the lower CMBS 2.0 delinquency rate will provide downward pressure on the overall delinquency rate. Lodging remains the best performing major property type, while retail remains the worst performing major property type, but its reading has improved in each of the last five months.